" Four Guitars to Two Synths "
GKMX-42 is a four-channel switching device for 13-pin GK equipped guitars as well as Standard guitars. The unit allows you to quickly grab a new guitar, hit the foot switch and take off with the next song. The unit is made for stage use and is sturdy and within a small footprint (170x120 mm). 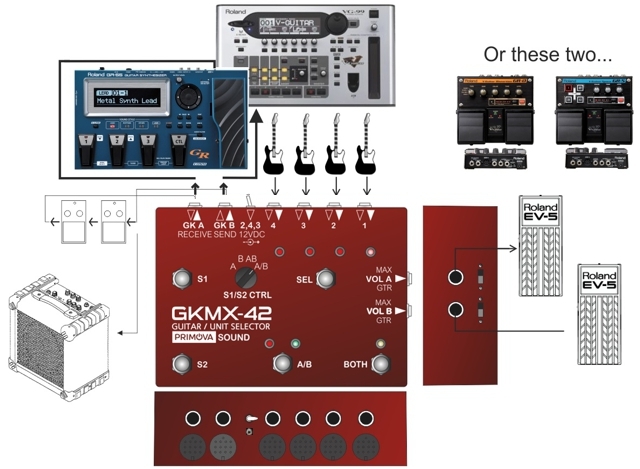 GKMX-42 has an integrated Roland US-20 compatible A/B unit selector combined with the possibility to connect external VOLUME pedals for each synth unit. It also has foot switches for S1 and S2 commands to control the synth unit(s). J1-J4 Guitar buffered input jacks for connecting up to four standard guitars, or GK guitars with separate cable for the regular pickups, i.e. two-cable meothod. GK OUT (A & B) GK output connector for Roland GR-33, GR-55, VG-99, GR-D, GR-S or other compatible 13-pin synthesizer. SEND Connect the SEND jack directly to your amp for better harmonics and lower noise of the regular pickup sound, or connect to optional effect pedals before the regular guitar pickup signal is routed back to the synthesizer using the RECEIVE jack. RECEIVE Connect to output of your optional effect pedals, or use the hexaphonic pickup for various guitar sound emulations in the synthesizer and then connect the Guitar out or Left or Right synth output to the RECIEVE jack for further COSM processing in the synthesizer (as if the emulated guitar signal was coming direct from you guitar). SEL FOOTSWITCH Selects one of the input channels. This switch will cycle through the input channels when engaged. 2,4,3 3-way switch allowing you to select the maximum number of inputs for cycling. Select 2, 3 or 4 guitars. S1/S2 CTRL Four-way rotory switch to select S1,S2 target: Unit A, Unit B, Both unit A and B, or the Actual Unit selected by A/B foot switch. This allows you to, for example, change synth patch of synth A using the foot switches and change patch of synth B with the guitar S1/S2 controls. S1,S2 FOOTSWITCH Sends S1 or S2 command to the unit selected by S1/S2 CTRL rotary switch. VOL A JACK If you connect an external Roland EV-5 or compatible expression pedal you may control the volume of synth A with the pedal. VOL A MAX/GTR If the switch is in MAX position, the volume pedal operates independant of the actual volume of your guitar. In the GTR position the guitar volume is the master volume, and the volume pedal may be used to further reduce the volume of synth A.
VOL B JACK Same as VOL A jack but for Unit B.
VOL A MAX/GTR Same as VOL A MAX/GTR but for Unit B. 12VDC The unit is powered by either synth A or B or by an external 0.8-1.5 Ampere 12 VDC adapter (not included). If more than two 13-pin guitars are connected and you are unsure about the power consumptions we strongly recommend using an external adapter. 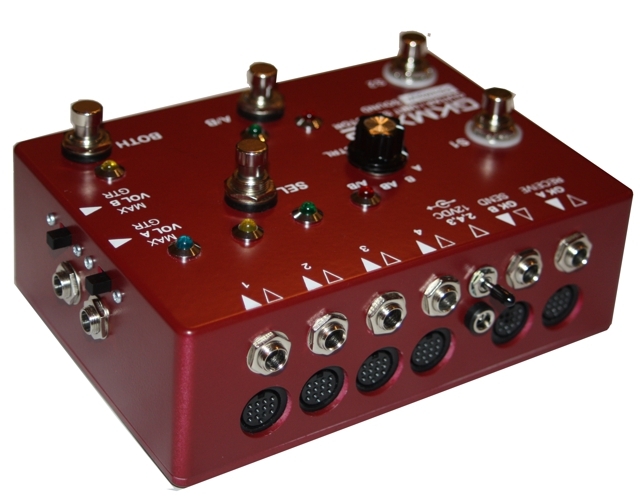 If a 12VDC adapter is connected you may also use the switcher as a 4 channel standard guitar switcher (no GK, no synth) and connect the SEND jack to your amplifier. The 13-pin inputs are compatible with Roland GC-1 or any other 13-pin pin GK-3, GK-2 or GK-KIT equipped guitar. The 13-pin output is to be connected to a guitar synthesizer, compatible with Roland GR-55, VG-99, GR-D, GR-S or earlier. All standard input jacks are buffered. The unit and your guitars are powered either by the connected synth or using an external 12VDC adapter. For standard guitars connected to one of the input jacks, only the regular pickup signal will be available to the output synthesizer unit. This unit does NOT convert regular pickups to MIDI. The warranty associated with this product covers the unit itself and the GK-cable(s) within the bundle. Any equipment connected to the unit, such as synths, guitars or other electronic equipment whatsoever, is NOT covered by the product warranty.